Starch is the carbohydrate storage unit of plants.It can be detected in a solution via starch-iodine test.If you have an unknown solution and you are asked to detect whether starch is present in this solution or nor, you would have to perform starch test.For this test,follow the procedure below. When iodine solution react with start a bluish color is obtained indicating the presence of starch.But this test can be affected by temperature and pH, which is explained below. If you want to distinguish between monosaccharide, disaccharides and polysaccharide, you should perform iodine test.This test would be positive for polysaccharide and negative for mono and disaccharides. 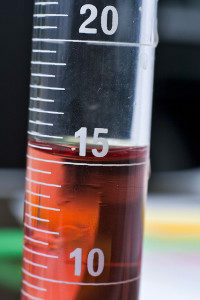 When iodine dissolved in potassium iodide solution react with starch or glycogen, it react with it and the color of solution is changes, indicating the presence of these polysaccharides. Some polysaccharides have have the property of adsorption for iodine.So, they adsorb iodine and give coloration. Take 1 ml of original solution and add it to a test tube. Add 1 to 2 drops of drops of iodine solution in it at room temperature. If the color of the solution changes, it means that polysaccharides are present in the original solution. Starch gives blue color while glycogen gives red color.While monosacchardes and disacchardes do not change color when treated with iodine solution. At low pH, like when acid (HCl or any other) is added to the solution, the color will turn dark blue.While in case of base such as NaOH complex will break and colour will disappear. At low temperate solution gives blue color when treated with iodine solution.While in case of high temperature, complex breaks and color disappears. You should not add acid or base in the solution because it will not give correct results with high or low pH. The test should be done at room temperature because change in temperature can alter results. Much appreciated Hamza. Am so positive about my practical write up anddi understand mostly why I was doing it. Can you please explain the mechanism of changes in starch due to the changes in the?